Note: This product is an educational discounted version available to qualified students and faculty/staff of accredited academic institutions only. Proof of current educational status is required. If you are unsure of your eligibility, please contact us prior to purchasing. 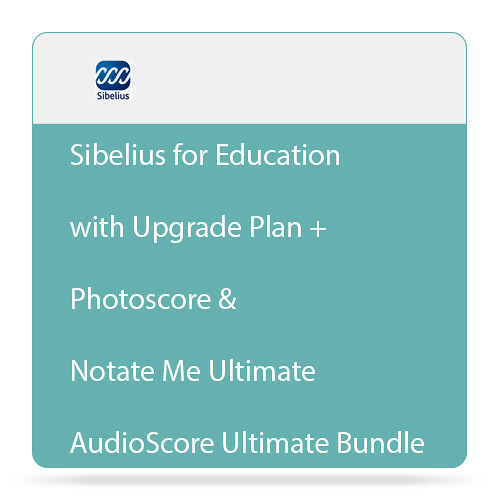 This electronic download of Sibelius + Ultimate Bundle from Avid allows you to purchase and own Sibelius (a perpetual license that never expires) bundled with PhotoScore & NotateMe Ultimate and AudioScore Ultimate. Your purchase includes an annual Avid upgrade plan for Sibelius that provides access to all future software upgrades and expert help for one year from the time of activation (renewable annually). Sibelius allows you to deliver professional scores faster and share audio and video versions with realistic musical phrasing. 64-bit support provides memory enhancements for loading as many instrument samples as your computer can handle. The task-oriented user-interface allows you to quickly preview your scores via the included professional-quality sound library. VST and Audio Units plug-in support provides access to third-party sample libraries. Collaborate more easily thanks to full MusicXML interchange support and other sharing options. Additionally, the software delivers features like Magnetic Layout and Dynamic Parts, plus a creative toolset including Flexi-time MIDI input, Keyboard and Fretboard windows, and a variety of other input options. You can also sync Sibelius with other popular audio software such as Pro Tools (via ReWire). PhotoScore & NotateMe Ultimate is the full-featured version of the PhotoScore & NotateMe Lite scanning software included with Sibelius. This software can also scan music into other MIDI software, such as sequencers. You can even use it on its own to scan in, play back, transpose, and print scores, and save audio files. PhotoScore & NotateMe Ultimate reads printed and handwritten music or PDFs quickly. It can not only read notes, but also printed slurs, dynamics, lyrics, guitar tab, chord diagrams, and more. You can then edit or transpose the music, play it back, extract the parts, and print; just as if you'd input it yourself. AudioScore Ultimate is the full-featured version of the AudioScore Lite audio transcription software included with Sibelius. With it, you can turn recorded audio or a MIDI or live mic performance into transcribed music notation.